Apart from massaging with a hand cream every night, follow these 8 easy DIY steps for a professional looking manicure at home. Well-kept and beautiful hands not only signify cleanliness but they can also imply the age of a person! We use our hands for doing all kinds of daily chores and even when we communicate with each other. Your hands, especially fingers come in contact with so many objects and cleansing agents while cooking, washing dishes and cleaning, resulting in dryness. Hence, it is not difficult for others to note that the skin on your hands is dry, flaky and wrinkled, and has unkempt cuticles. Do take out a few minutes from your schedule and give care and attention to your hands and nails. Apart from massaging with a hand cream every night, follow these 8 easy DIY steps for a professional looking manicure at home. Please ensure that the tools and towel are sterilized before going ahead with your manicure. This should be done both at home and at your nail salon where the tools are used on multiple people. Ignoring this can cause infection. Step 1– You can start with your nails by using a four-sided nail file. 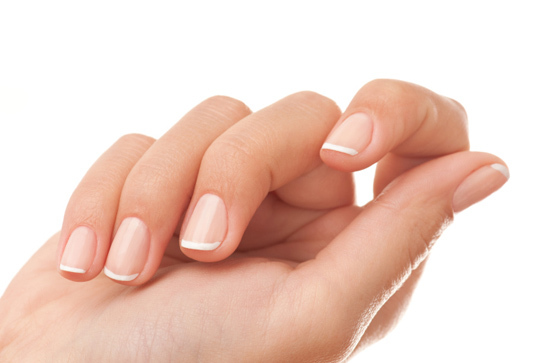 Shape, buff, smooth and shine your nails to make them look perfect and healthy. Always remember that nails are delicate when they are wet and thus never cut or file them at this stage. Step 2– Once you are through with the nails then soak your hands in lukewarm water for 5 minutes. Add a few drops of oil such as almond or coconut oil, easily available in your kitchen, to the water for extra nourishment. Soaking will soften the skin and cuticles and will result in effective exfoliation in the succeeding steps. Step 3– Gently dry your hands with a towel and start working on the extra cuticles on the sides and at the end of your nails. Push back the cuticle area with a cuticle stick and carefully trim only the excess from the sides. Cuticles protect the skin around the nails from infection hence be cautious and do not remove more than required. Step 4– After trimming the excess, condition the cuticle area with nourishing oil. Massage each nail as the cuticle area is delicate and often gets dry. This will give your nails a polished look like you get in a professional manicure session. Step 5– To reveal shiny and soft skin, take a small quantity of your regular face scrub and exfoliate the back of your hands with it. The skin on your hands is delicate and soft and needs care. Exfoliate the back of your hand and fingers in circular motion for a few minutes and let it soak in the water for a minute again. After this, towel dry and massage your hands with either nourishing oil or hand cream to seal the hydration. Step 6 to Step 8 (Optional)– If you wish to apply a nail paint then follow Step 6 to Step 8. Step 6– Thoroughly dry and clean each nail from any oil or water and apply a layer of base coat. A base coat prevents the nail from getting stained and also aids in smooth nail paint application. Step 7– Follow this with 2 coats of your nail paint. To increase its wear time, avoid applying the nail paint in thick coats or on the cuticle area. Step 8– The final step required to complete the look would be to apply a top coat on your nail paint. Once the nail paint is completely dry, apply the top coat and seal the edges so that the nail paint does not chip or peal sooner than required.